Shad Cam is currently experiencing technical difficulties and will return as soon as possible. Shad Cam will automatically refresh in 5 seconds. On occasion, you may see a blank or "broken" image. If this happens, you can manually refresh the page using your browser controls or simply wait for the Shad Cam to refresh itself. 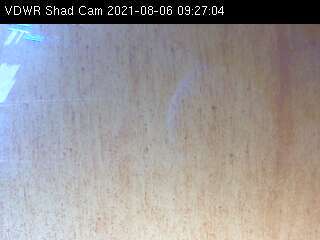 Prefer to view Shad Cam in a pop-up window? Welcome to the Virginia Department of Game and Inland Fisheries’ (VDGIF) Shad Cam project! The Shad Cam will be active from late March through early June. Over the past 35 years, populations of American shad, hickory shad, alewife, blueback herring, striped bass, and other anadromous fish species have steadily declined in Virginia. VDGIF, in collaboration with a number of other partners, has been working to bring back these fish, mostly by restoring access to historic spawning areas throughout coastal Virginia. In the James River, these species were known to spawn as far upstream as Eagle Rock until two sets of dams, in Lynchburg and Richmond, cut off over 400 miles of the river and tributaries. In 1999, a fishway was constructed at Bosher’s Dam, providing fish with access to 137 miles of the James River and 168 miles of its tributaries for the first time in nearly 200 years. A camera at the fishway provides visitors a peek into this incredible journey as the fish return to spawn in the spring. The majority of fish species will ascend the fishway during the day while catfish species and sea lamprey will primarily move upstream at night. Spawning runs of anadromous fish in Virginia generally occur between March and early June.